Spring is here! A year ago, I was excitedly anticipating baby’s arrival. Spring is when things come to life and bloom. I have always loved this time of the year in Vancouver. If you are visiting or living in Vancouver, you may share this similar love for the city. One of my loves in downtown Vancouver is seeing cherry blossoms. This year it holds a special time for me because it is Emily’s first time seeing cherry blossoms. I was keenly watching her expression when she saw them. 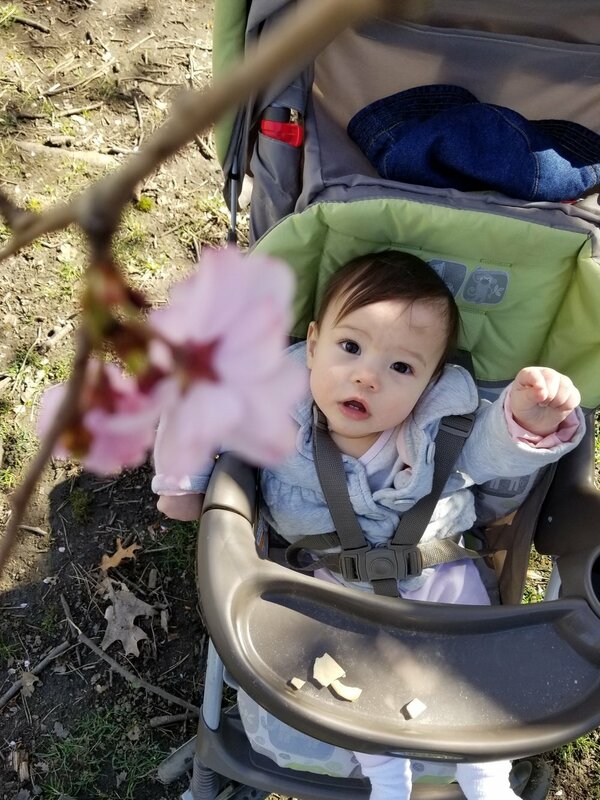 She looked at the cherry blossoms for much longer as this was her first time seeing it. It was a look of wonder. I have so much appreciation for the way she takes a pause and take in her surrounding with curiosity. I can’t convey enough how special this time is for me, nor how that made me feel. She is growing and I am feeling renewed. I have yet to sit down for a picnic under the cherry blossom. But here are some street names that are top of mind for me for seeing them while walking or strolling with a baby (Haro street between Thurlow down to Denman), and Bute (between Haro to Comox). Am sure there are lots more, I will continue to investigate or please share with me :). I also found this website that is dedicated to cherry blossoms in Vancouver and includes some up to date flags on cherry blossom sightings. There are many resources around on where to find the best spots to view cherry blossoms in the city - but for me personally, I find so much joy by just strolling around the west end because a) this is my neighbourhood and the close proximity is a plus b) it is free I only needed to start walking to enjoy the beauty.